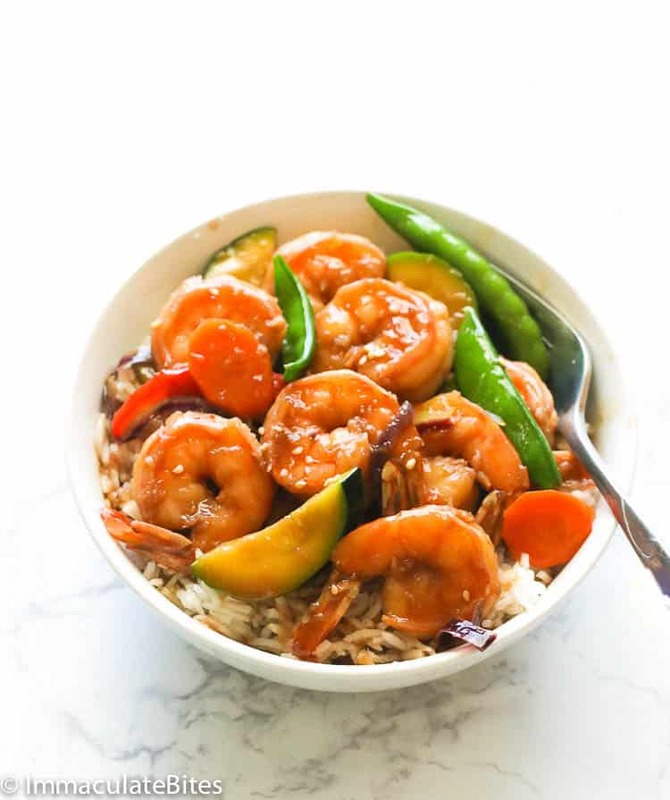 Shrimp Stir Fry – a quick and easy shrimp dinner with a honey soy garlic based sauce accompanied with vegetables that comes ready in 20 minutes from start to finish. A healthy and easy meal to enjoy any time! After all the cooking, baking, munching, and heavy eating last weekend, I decided to go for light, quick and easy meals. And all I could think of at that time was anything stir fried! 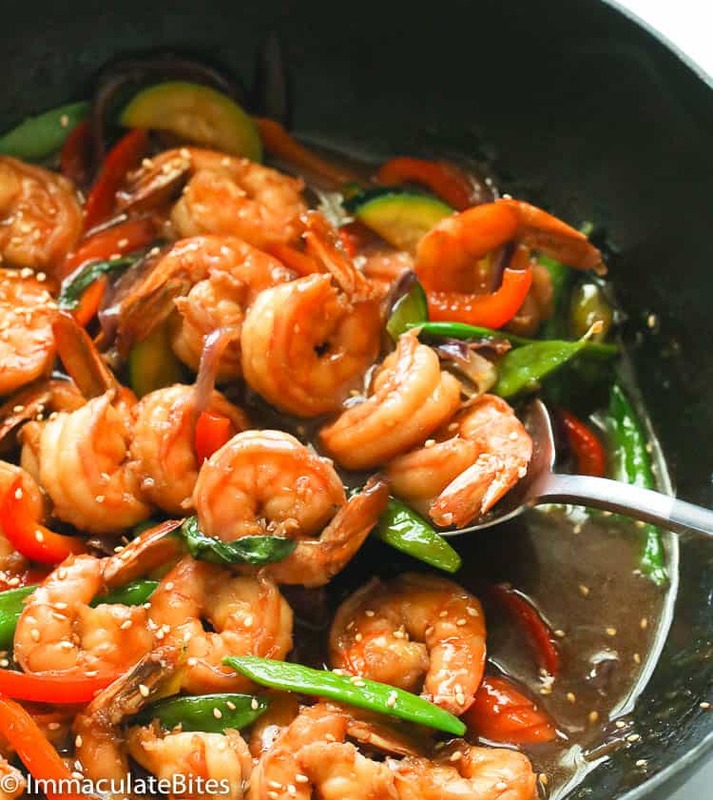 Oh, we do love stir fry recipes; we’re a huuuge fan of it especially when we’re so pressed with time or basically just too lazy to labor an hour in the kitchen for a dinner. I swear, food bloggers are no exception when it comes to cooking burn out. 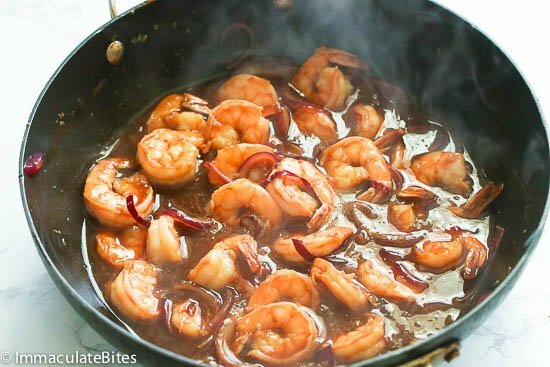 How to cook shrimp stir fry? Thankfully, I still have some shrimps coupled with veggies in my fridge. And so I finally decided to make a stir -fry dish out of it. BOOM! Dinner in less than 20 minutes; how about that? Honey-Soy Based Sauce. So I started by mixing the the base for this recipe first which is a combination of soy sauce, chicken stock, cornstarch and honey. I love using the Kikkoman soy sauce, but basically, you can go with any brand of soy sauce. For those who are new to soy sauce, it is a sauce made with fermented beans and it is a staple in Asian cuisines. If in case you don’t have it on hand, you may substitute soy sauce with coconut aminos, maggi seasoning sauce, fish sauce or Worcestershire sauce (3 tbsp Worcestershire mixed with 1 tbsp water). 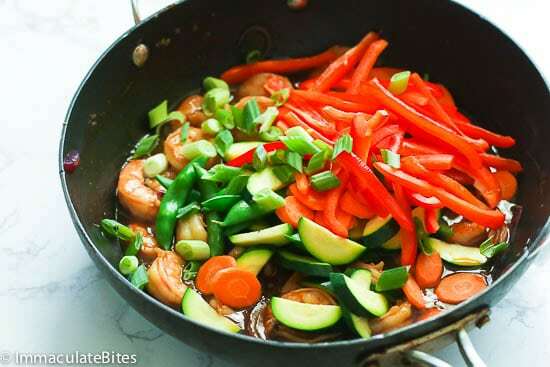 Stir Frying the Shrimps and Veggies. After mixing the sauce, set it aside. 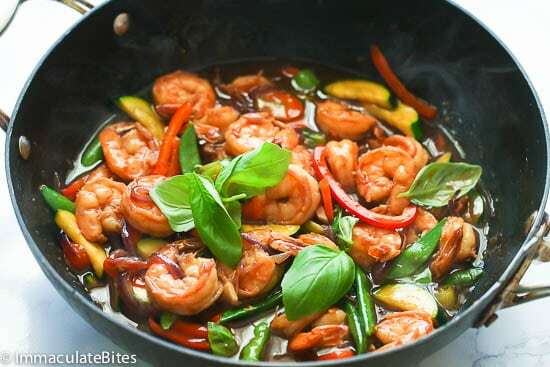 Remember tho that you have to prepare all the ingredients before you start cooking as stir-fry is sort of a quick cooking that utilizes high heat in a short time. 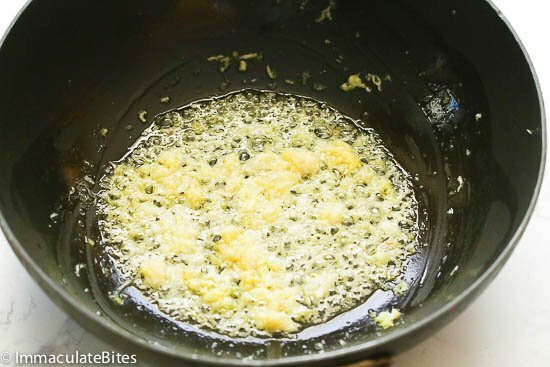 When you’re all ready, heat up your wok or skillet, pour oil and saute garlic and ginger, then followed by onions. Cook them until fragrant. 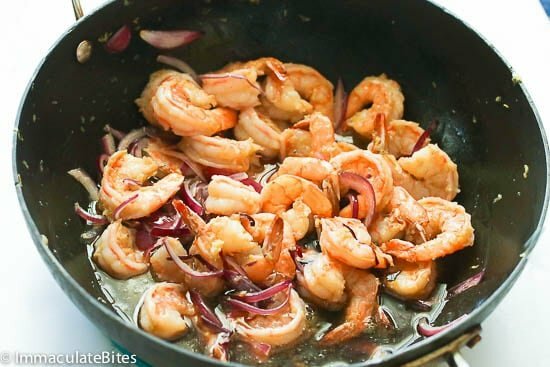 Stir in shrimp and cook them for about 1-2 minutes. Then pour in the soy sauce mixture and let it thickens. Once it thickens, throw in the vegetables and cook for about 2-3 minutes. You may adjust the sauce at this point. Add more broth if you prefer a thinner sauce. Lastly, throw in basil, adjust seasonings and remove from heat. If you know by now, everything happens so fast when cooking stir-fry recipes. That’s why it’s a favorite here at home. 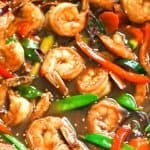 Can you make this shrimp stir fry ahead of time? 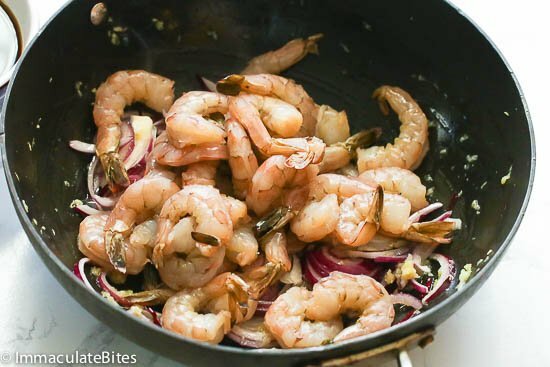 As much as we want an easier route to every meals we can have, seafood dishes like shrimps are not the freezer-friendly type. But you certainly can prepare them in parts. You may mix ahead the sauce ahead of time and place in the fridge or peel and devein the shrimps ahead, that is if you don’t buy the peeled one at the grocery store. I tend to buy the peeled and deveined one as they are pretty convenient. Looking for other easy weeknight meals? Oh don’t you worry. Here are some of them that you can add to your recipe box. I used carrots, zucchini and snap peas in this dish, but you can actually add whatever you have in your fridge like broccoli, baby corn, bamboo shoots, mushrooms and more. Stir-fries are the perfect meals to use up whatever you’ve already got in your fridge. 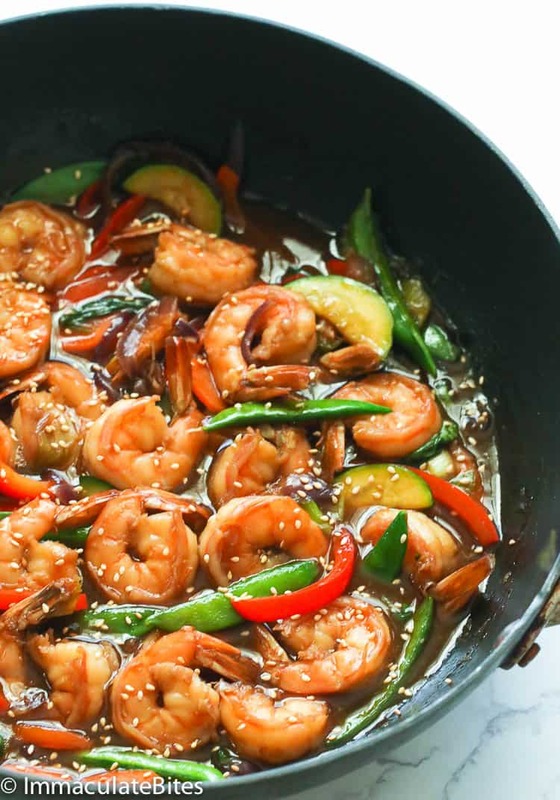 Serve this Shrimp Stir Fry over warm rice. Since stir-fries cook so quickly, it’d be better to have your rice all ready so you can serve this dish right away and enjoy. This sauce is a good base recipe which means you can substitute shrimps with sliced chicken breast or thighs, beef, pork loin or scallops. 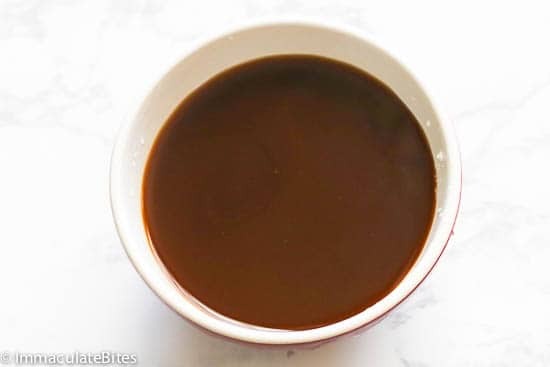 You may substitute soy sauce with coconut aminos, maggi seasoning sauce, fish sauce or Worcestershire sauce (3 tbsp Worcestershire mixed with 1 tbsp water). 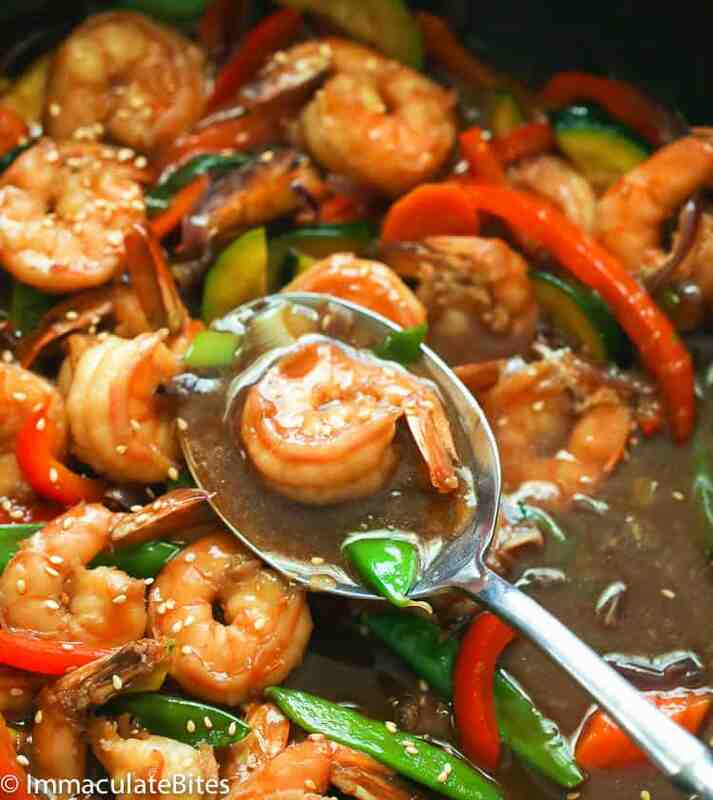 Shrimp Stir Fry - a quick and easy shrimp dinner with a honey soy garlic based sauce accompanied with vegetables that comes ready in 20 minutes from start to finish. A healthy and easy meal to enjoy any time! Whisk together soy sauce, chicken stock, cornstarch and honey. Set aside. Heat up the skillet with about 2 tablespoon of oil. 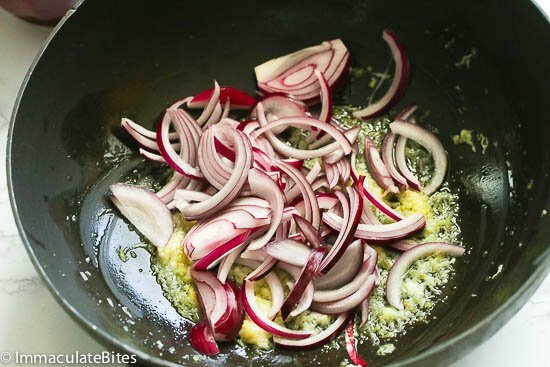 Quickly stir in garlic and ginger into skillet, let it cook for about one minute or less. Do not let it burn. Add in onions continue cooking for another 2 -3 minutes. Stir in shrimp , and cook for about 1-2 minutes. Pour in soy sauce mixture and let it cook until it thickens. Add vegetables, red bell pepper and green onions, continue stirring , about 2-3 minutes. Finally throw in basil, If desired, you may adjust with broth. Season with salt, pepper and red pepper flakes. Heat up the skillet with about 2 tablespoon of oil. Quickly stir in garlic and ginger into skillet, let it cook for about one minute or less. Do not let it burn. Add in onions continue cooking for another 2 -3 minutes. Pour in soy sauce mixture . And let it cook until it thickens. Thanks so much for recipe. I just made it & I added dried chili peppers.